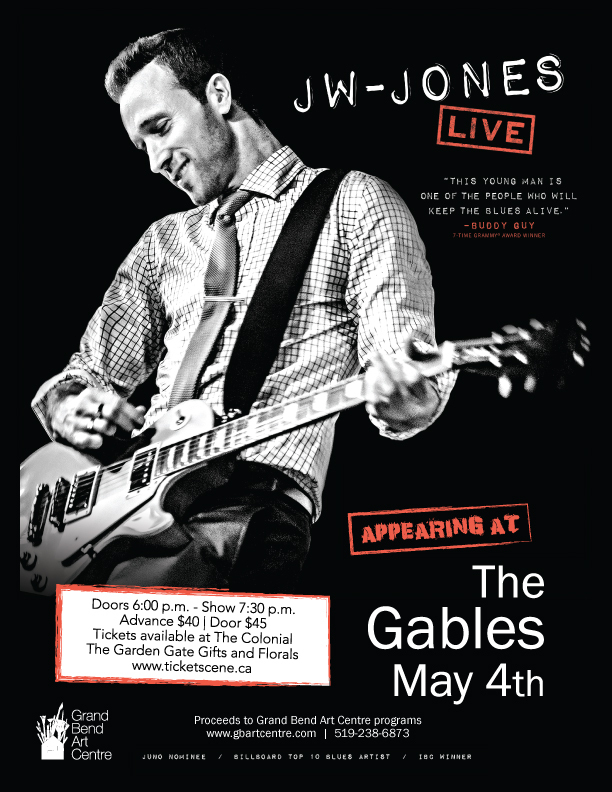 On May 4, the Grand Bend Art Centre continues its 10-year tradition of bringing top international musicians to the area when it presents versatile blues guitar virtuoso JW-Jones in concert at The Gables. Known for his live performance showmanship built around his “lightning in a bottle” guitar playing and thoughtful song selection, Ottawa based Jones is one of Canada’s top blues stars. JW-Jones has won multiple awards, appeared regularly in the Billboard Top 10 having released ten albums, and is an international touring sensation who’s thrilled audiences in 23 countries on four continents. Joining Jones on stage is his crack rhythm section comprising the inimitable Will Laurin on drums and the renowned Jacob Clarke on electric and upright bass. “This is an amazing blues band” says Dan Ackroyd; “Never fails to electrify the crowd” says Ottawa Bluesfest organiser Mark Monahan; “His evolution as a musician and vocalist shine through… JW is the real deal” says Rolling Stones keyboard player Chuck Leavell and “This young man is one of the people who will keep the blues alive ” says 7-time Grammy Award Winner Buddy Guy for whom JW-Jones has opened on six occasions. Get tickets $40.00 in advance ($45.00 at the door) from the Colonial Hotel (cash), The Garden Gate Gifts and Florals (cash) and www.ticketscene.ca (service charge) as well as at the Paint Ontario Art Show and Sale at the Lambton Heritage Museum from March 29 to April 20. The GBAC is registered as a charity with the CRA and partial tax receipts will be available for concert supporters at the event. Doors open at 6:00 PM with a special pre-concert menu available; showtime is 7:30 PM. Proceeds contribute to funding of local arts programs, in particular Grand Bend’s Community and School Music Programs which, for the past four years, have been successful in bringing music into the lives of area children and young people where it had previously been absent. The show coincides with “The Stars Come Out”, the popular annual Arts, Eats and Beats Studio Tour Weekend. This is one concert that’s not to be missed. Mark your calendar and bring your friends to this high-energy live music experience!